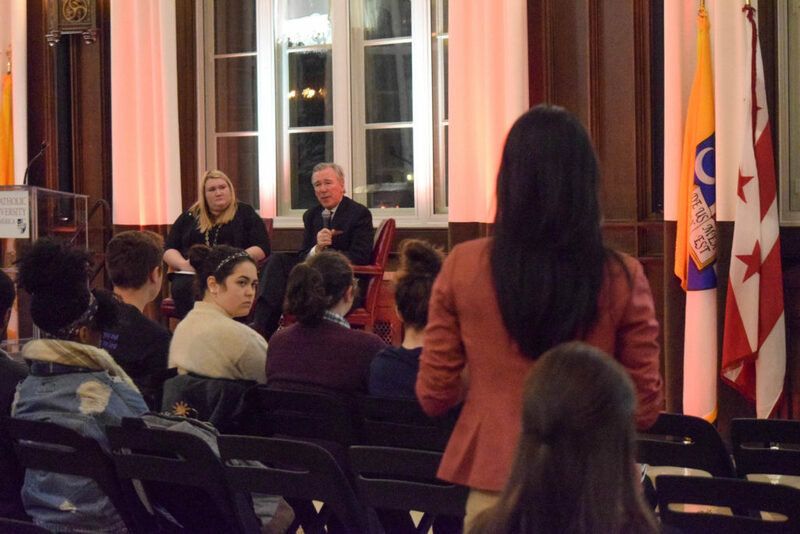 Catholic University President John Garvey addressed the student body in a Town Hall on Tuesday, March 20th to inform them of new projects that the university is undertaking, improvements in different academic programs, and the overall status of the university. Put on by the university’s Student Government Association (SGA), this event is meant to enlighten students on the affairs of the university and give them the opportunity to pose questions for the president. The town hall was held in Heritage Hall, a switch from the Pryzbyla Great Rooms where it has been held in the past. Roughly 200 students and administrators attended on a cold and rainy night before a snow day. Before Garvey spoke, SGA President Brianna Howard addressed the crowd with a small “State of the Union” address, highlighting the work SGA has done within the past year and its continued effort to be the voice of the student body at the university. Then President Garvey took the stand to comment on a few ongoing university projects and describe his vision for the university’s future. Garvey spoke on the ever-changing atmosphere of higher education, how recent trends have affected universities across the nation in regard to enrollment, and how the Catholic University of America is constantly improving its campus to draw students in. Garvey began by commending the SGA for the new crosswalk that was put in across the McMahon Parking lot over spring break. He then described other ongoing and future university projects such as the installation of new heating systems throughout campus, the creation of a new pedestrian walkway by the metro entrance to campus, new turf fields for soccer and lacrosse, as well as the anticipated new dining hall and final renovations to Maloney Hall, which will house the Busch School of Business when it opens. All of these renovations have been included in a Master Plan that can be viewed on the university’s website. Some larger campus improvements were also mentioned, like the plan to expand the DuFour Athletic Center and a potential new space for the performing arts. These renovations and upgrades to the university stated in the Master Plan are to be funded by the capital campaign, which is currently in its preliminary stages. In building such a campaign, areas such as the intellectual experience and how much capital need to be through about before any of these projects get underway. Next, Garvey spoke on is the university’s new Academic Renewal campaign. This renewal includes a new liberal arts curriculum to be implemented for the incoming freshman next semester, as well as a proposal from the Undergraduate Provost that is to combine the departments of Art, Drama, Music, and Media and Communication into one school to be known as the School of Music, Performing, and Visual Arts. Garvey summarized that these changes should enhance the student experience and make the university more marketable on the whole. Other areas touched on by the President included campus safety, immigration issues in relation to the university students and staff, as well as his recommitment to be the university’s president. The floor was then opened to student who posed questions regarding capital campaign funding, the construction by the metro entrance to campus, and the master plan. The first question of the night was posed by junior Duane Paul Murphy, on the topic of enrollment. He questioned how the university as a Catholic institution is responding to the changing demographics of the nation. Garvey replied by saying that the university has increased it population of students of other religions as well as looked to focus on other areas such as philosophy in accordance with theology. However, Garvey said that this is a complex challenge and families are less likely to spend money on education than they used to. The most applauded question of the night was posed by junior Media and Communication Studies major Julianna Fullam, who asked about the future of the department and school that houses her specific interests. Apologizing for her shaky speech, Fullam expressed serious concern about changes to her education. In response, President Garvey emphasized that this proposal is just that, a proposal. He spoke about how this document still has three to four more stages of revision it must undergo before it is presented to the Board of Trustees to be signed and approved. He also pointed out that this program is not to change what already exists, but to create new possibilities. Instead of just analyzing how media works, students might have the opportunity to actually experience different areas involved in media, such as film, that have not been offered previously. He urged students to attend the meeting with the Provost the next day for more specific answers. To end the night, Howard thanked Garvey for coming to speak with students in person and the students for braving the weather to attend.